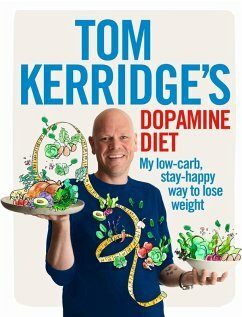 Thanks to his Dopamine Diet, Michelin-starred chef Tom Kerridge has shed eleven stone over the past three years. That's the same as 70 bags of sugar. If you're struggling with your weight and need to shift unhealthy pounds, this new approach makes it easy, and is guaranteed to make you feel happier in the process. Most people find it hard to keep to a long-term diet, but this one is different. The recipes feature ingredients that trigger the release of the 'happy hormone' dopamine in your brain, so it's a diet that will make you feel good! Tom's 'dopamine heroes' include dairy products such as double cream and yoghurt, good-quality meats including beef, chicken and turkey, and even chocolate. By ditching alcohol and starchy carbs in favour of plenty of protein, fresh fruit and veg, you will be eating meals that will help you shed the weight, whilst offering a satisfying intensity of flavour. Treats in store for Dopamine Dieters include spinach, bacon and mint soup; roasted onion salad with fried halloumi; shepherd's pie with creamy cauliflower topping; soy glazed cod with chilli, garlic and ginger; braised beef with horseradish; Chinese pork hot pot; and chocolate mousse with sesame almond biscuits. These are recipes that don't feel like diet food, and can be shared with friends and family. It worked for Tom and it can work for you. Give it a go! And lose weight the Dopamine Diet way. Tom Kerridge worked as a chef in restaurants across Britain before deciding to set out on his own and take over a rundown pub in the quiet Buckinghamshire town of Marlow. He opened The Hand & Flowers with his wife Beth in 2005, and it went on to become the first (and only) pub in the world to acquire two Michelin stars. In 2014 he opened a second pub in Marlow, The Coach. As well as hosting two of his own BBC television series, Tom has been at the helm of the BBC's Food & Drink and Bake Off: Crème de la Crème. His previous books include Proper Pub Food, Tom Kerridge's Best Ever Dishes, Tom's Table and the bestselling Tom Kerridge's Dopamine Diet and Lose Weight for Good.